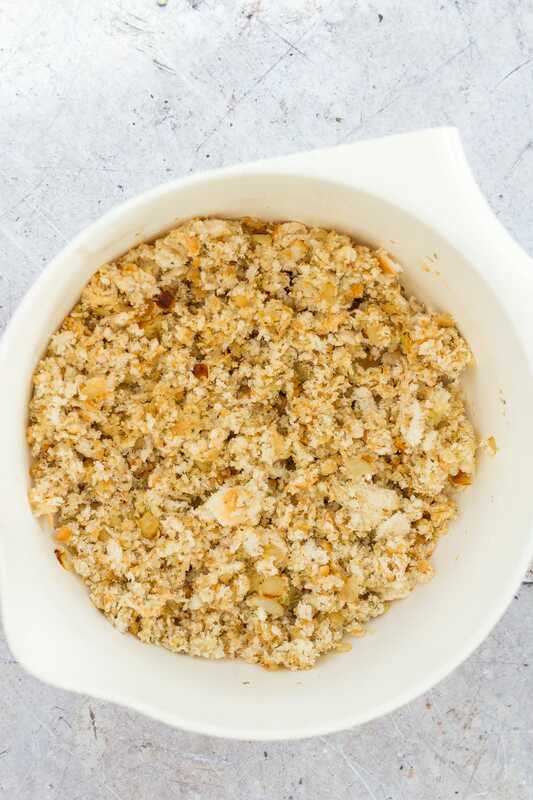 Want an easy stuffing recipe that can be made ahead of time and takes just a few minutes? 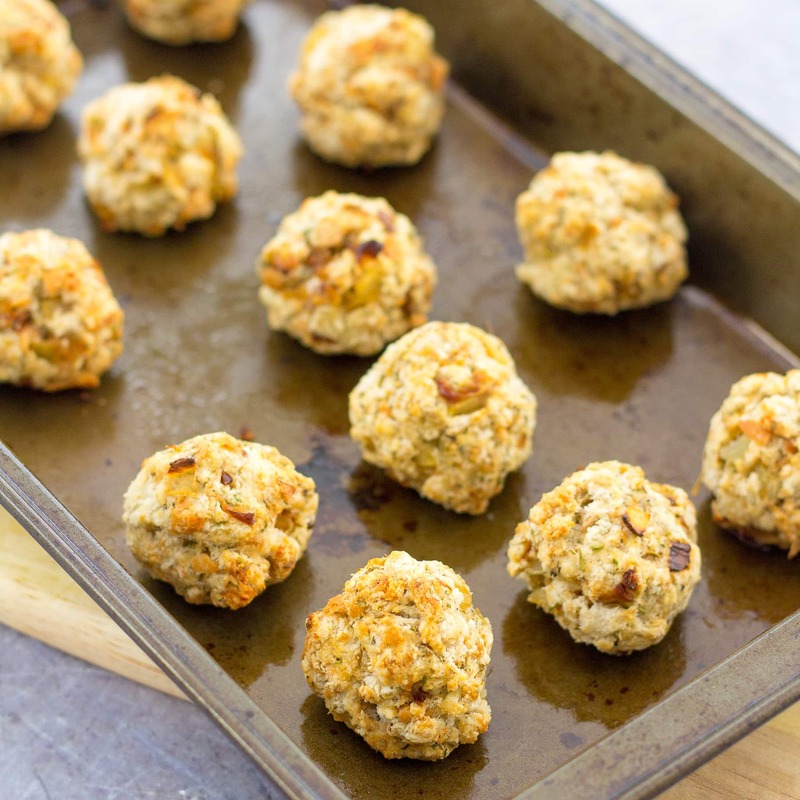 Try my delicious Easy Sage and Onion Stuffing Balls recipe that has been in my family for decades! 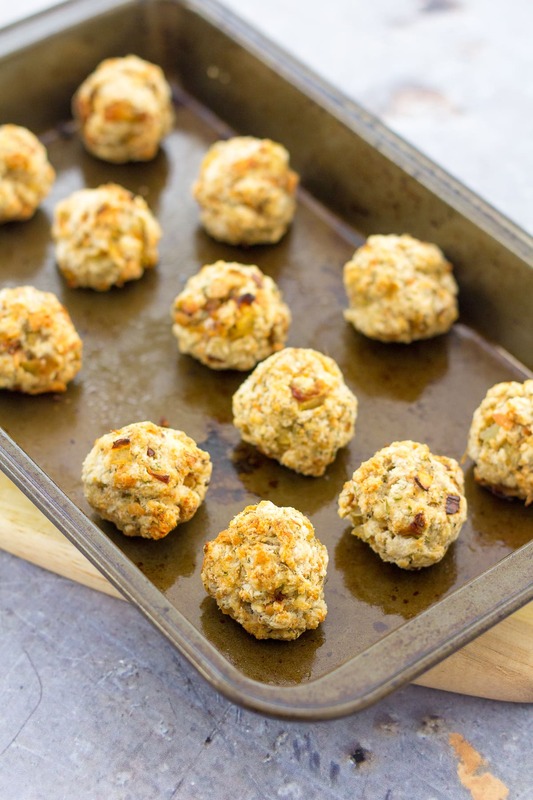 This Easy Sage and Onion Stuffing Balls recipe has been in my family for years – decades in fact. Mum and Dad would often make it for our Sunday roast and especially at Christmas. The smell of sweet cooked onions mingled with sage has always been a quintessential part of Christmas for me since childhood. This Easy Sage and Onion Stuffing Balls recipe is the perfect accompaniment to roast chicken, roast turkey or roast duck. I love shaping this delicious stuffing mix into cute little balls and cooking them separately. Cooking them separately means they cook really quickly and go super crispy on the outside. This is also perfect if you have vegetarian guests, as it means they can enjoy this gorgeous stuffing too. If you prefer, however, you can of course use the Easy Sage and Onion Stuffing mixture to stuff the neck cavity of a turkey, or to stuff the main cavity of a chicken or duck. Do remember to weigh your bird once stuffed and calculate the cooking time based on the stuffed weight. The Easy Sage and Onion Stuffing Balls recipe calls for 200g (7oz) white breadcrumbs. When I make this stuffing, I just buy an ordinary loaf of white bread and grate it on the large holes of a cheese grater. It takes about 5 minutes to do this and is easy peasy! But you can also buy ready-made breadcrumbs from the supermarket, if you prefer. If you want to get ahead, you can make these Easy Sage and Onion Stuffing Balls the night before. Place them in an airtight container in the fridge overnight and cook them as per the instructions below the following day. How to cook perfect roast turkey – the stress free way! 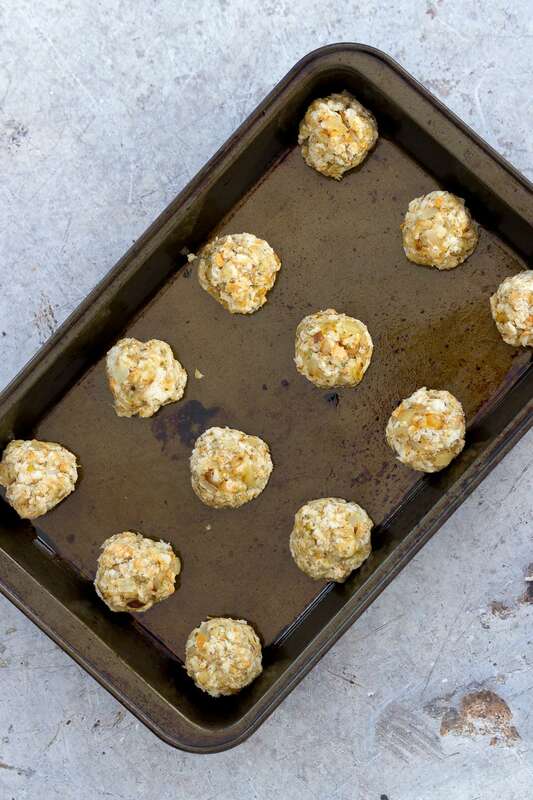 Preheat your oven to 200C / 180C fan / gas mark 6 / 400F and grease a tin big enough to hold all the stuffing balls – I usually use a small roasting tin. Drizzle a tablespoon of olive oil into a saucepan. Add the diced onion and put the lid on. Cook over a low heat for about 5 minutes, stirring occasionally, until the onion is soft but not brown. When the onions are ready, tip into the bread crumbs. Add the herbs, salt and pepper and stir thoroughly. Allow the mixture to cool slightly and then add the beaten egg and stir together. Divide the mixture into 12 and shape into balls. Place in your greased tin and cook for 30 minutes or until they are golden brown and cooked through. (1) To make white breadcrumbs, just by an ordinary white loaf, cut into thick slices and grate on the large holes of a cheese grater. It takes less than 5 minutes to get enough breadcrumbs for this recipe. 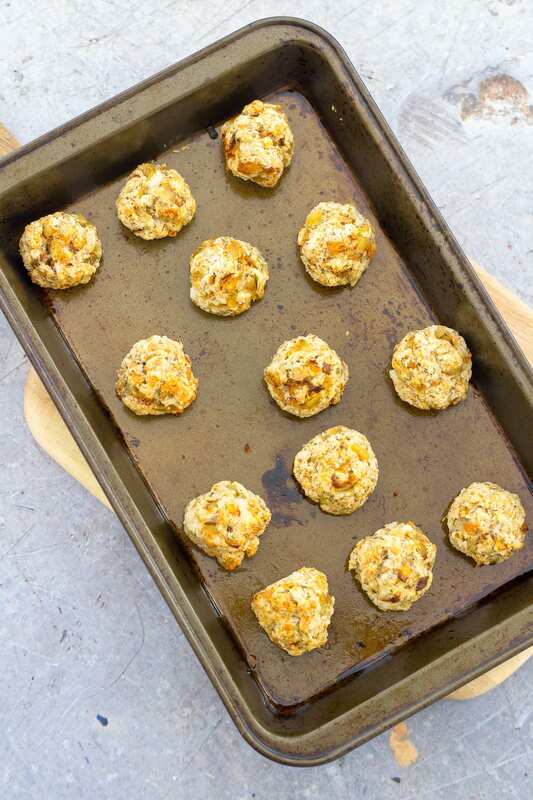 (2) If your oven is set at 180C / 160C fan/ gas mark 4 / 350F when you want to cook these stuffing balls, don’t worry, they will still cook happily at this temperature, but you will need to cook them for about 40 minutes. Just made this again. Great recipe! And goes so well inside a duck! 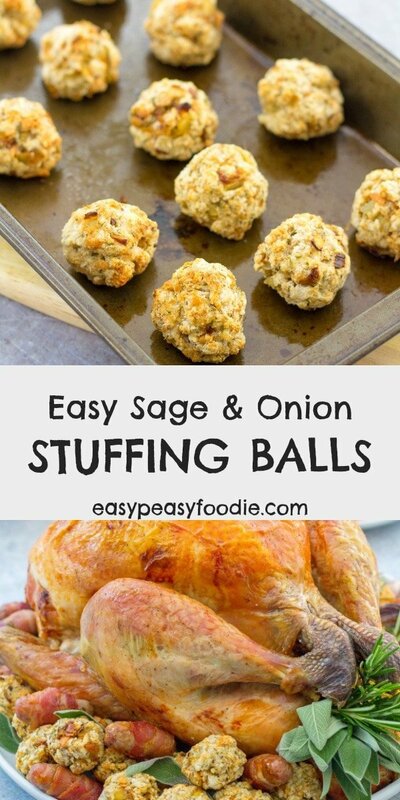 I love sage and onion stuffing and think these must be so tasty! I only have one stuffing recipe so I know I should branch out and try something a little different (for me!) one day. Thanks for sharing with #CookOnceEatTwice! What a great way to get ahead for Christmas, the stuffing sounds so delicous.